This Plastic Slide Playground has got everything!. It includes all the outdoor plastic play equipment you need to make a complete playground for your toddler. The Little Tikes playcenter playground features a wonderful variety of plastic play equipment which is sure to engage active toddlers. 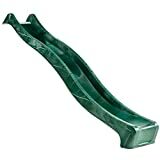 Its an attractive plastic slide playground that will hold a toddlers interest and attention. The rope or the ladder ? The play platform of this plastic slide playground can be accessed in two ways. First, there’s a ladder to climb up at the rear of the platform. Then, for added excitement, there a rope climbing frame at the side of the platform for toddlers to clamber up. The ladder to the fort area is a straight one and may prove a challenge to younger toddlers. The rope climbing net is a fantastic stimulant to imaginative play. Prepare to board pirates! Outdoor plastic play equipment like this playset is worked tremendously hard and we’re pleased that all the reports we’ve had comment on how this climbing net resists the weather and the best efforts of the most active of toddlers. The wave slide on which kids descend from the play platform is also strong and sturdy. It has quite a sharp gradient and provides an exciting ride. High handrails on the slide make this quite a safe plastic slide playground. All these features make the Little Tikes Play Center Playground a boon for toddlers’ imaginative play. Included in the Endless Adventures play center playground are three swings. There are two regular swings with plastic seats. These are a good size and height for young children. Toddlers will love the glider swing. You ride astride a glider holding onto the guard rail. Two kids can sit together on the glider. It’s great fun as they swing each other up and down. 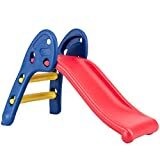 We’re pleased to see that this plastic slide playground play set also includes the facilities for quieter sand and water play. Underneath the play platform is a good sized built in sand box. This comes with a plastic lid for keeping out the rain and unwanted debris. There’s also a plastic toy storage compartment. In the warmer weather this can be filled with water and used for sailing toddlers boats, filling buckets and other water play. It has a drain plug so can be emptied easily. Have you got the space? The Little Tikes play center playground is quite a large piece of outdoor plastic play equipment measuring 14 feet wide and a little over 9 feet deep. A play area of 26 feet by 21 feet would provide an adequate safety zone around this plastic slide playground. Don’t forget that outdoor plastic play equipment for toddlers like this playground needs to be anchored . The anchoring system is included in the pack. Considering this is such a large playground it is very quick and easy to assemble. It requires little maintenance. We’re big fans of Little Tikes outdoor play centers. They are strong, durable and very well designed. 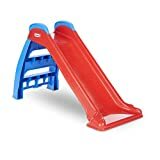 This plastic slide playground, in particular, offers a great variety of play features and is one that toddlers will enjoy and make use of for a very long time. or return to our selection Outside Toys. Prices are accurate as of April 25, 2019 4:43 pm. Product prices and available are subject to change. Any price and availablility information displayed on Amazon.com at the time of purchase will apply to the purchase of any products.